In many game systems, there are rules in place to accommodate playing characters with disabilities. This article is not so much about the rules as it is about the playing of those characters. The role-playing rather than the roll-playing, if you will. In a LARP I was recently in, I chose to play a character who was dependent on a cane. This is because I sometimes benefit from the use of a cane when my arthritis is flaring up, but there is generally no mechanic for the inbetween needs. In many game worlds, you either need a cane at all times to walk two steps, or you don’t need one at all ever. 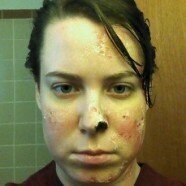 Dr. Woods was also covered in burn scars, missing part of her nose, and very cranky. And I’m mostly posting this picture because I am pleased with the makeup, even though it has very little to do with the article. This is quite unlike real life, but fits the image that most people see of persons with disabilities in popular media. And, besides, let’s be honest, a lot of gaming is unlike real life. When building the character, Dr. Woods (a Nosferatu for a Vampire LARP), I had a bit of an advantage in that I have experience with disability. The fact that she used the cane influenced her personality in several ways; in particular, she found it to be incredibly rude when she was ignored or underestimated. Pro tip: don’t piss off a Nosferatu. She also was very harsh on her Vampire companions, and expected a lot of them. What she didn’t expect or appreciate was pity. She was perfectly capable of doing nearly anything that she set her mind to. Research! Having a disability is a major impact on someone’s life. From personal experience, I have been ignored while using a cane (useful at the mall when walking past kiosks; not really useful at any other time, and pretty obnoxious), had strangers demand to know intimate details of my medical history, had oblivious people kick my cane out from under me, and, of course, the many people who did not believe that someone so young and healthy-looking could need a cane. If you do not have personal experience with disability, well… You are on the Internet right now. Go find information. Read articles and blog posts, preferably from people with the disability you will be playing. Looking for a place to start? Check Tumblr tags like wheelchair, ableism, disability, etc. There is a wealth of information out there. Focus on your character’s abilities! This may involve getting creative. Fortunately for Dr. Woods, she had enough allies that if anything involved ambulating long distances, she could delegate. But she still had plenty of points in Potence. Sure, she couldn’t pick up a bus and run with it, but she could throw it from where she stood. She was also very intelligent, an expert surgeon, and if need be could impersonate anyone she would need to. She would just move at half speed while doing so. The STs also worked with me on making sure that there were things for Dr. Woods to do. When we had one combat-heavy game, she stayed on the back lines with a huge cooler full of blood packs (or Capri Suns, however you want to view it). Other than that, there was certainly enough political intrigue to keep her involved in the game. Ultimately, in a good game, there should almost always be something for your character to do. (Okay, that one time I played a pacifist in a Pathfinder game? I did a lot of waiting around during combat and then healing people at the end. That was a character choice that I made going in.) I think this is a good thing to sit down and discuss with any GM regardless of if a character has a disability or not. The GM should know what the players are looking for in a game so that they can help make sure everyone is able to be included and have fun. This is such a huge topic that could be expanded into its own articles on things like where to find research, ableism in game worlds (and in gaming culture) and how and why game mechanics don’t match up with how disabilities work in the real world. I will probably do more articles on this topic. What would you like to see? To get discussion started: Have you ever played a character with a disability? What was your experience like? Alternatively, are you a gamer with a disability? What experiences have you run into in the gaming world and gaming culture? If you haven’t encountered her before, you might really appreciate Heather Grove at Errant Dreams. She wrote a similar article about approaching Mental Illness in roleplaying that takes a similar tack. I will definitely check it out! I focused on psysical disabilities in this post since it is what I am more familiar with. Ahh, finally read your article. 🙂 I remembered we had a good talk about this post on our most recent road trip, so I’m glad to see it up.